The debate about ebooks and digital being the future IS over. Sometimes in the whirl of debate, discussion and faux innovation that has surrounded the shift to digital, you can forget fundamental principles. Something about the tone of the discussion at the moment got me thinking about where we are and what it means. Which of course is no major deal. Why on earth should publishers worry? Does it really matter if a book is sold as a paper product, as an audio CD, as a downloadable eBook or as part of a subscription based updatable online book, or indeed some combination of these? NO. IT ONLY MATTERS THAT IT SELLS. I get the sense that most publishers at least in the UK, USA, Canada and Germany and probably in France, having tasted the sweet ambrosia of digital revenue and seen the impressive growth of ebook sales, are there now. Maybe they don’t admit it too loudly, but I’m sure most senior level publishers have looked at the numbers, and they like them. You can see then book publishers face a problem like print publishers. EBooks do not attract high prices. That is to say that I think most people feel that an eBook is less valuable than a real live (dead in Jeff Jarvis’ world) paper book. 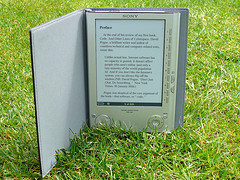 If an e-reader appears that quickly changes the market and shifts content online and into digital form as rapidly as music sales have shifted, traditional publishers will be faced with enormous difficulties. Their print runs will need to slide, their high costs need to be removed and eventually some books will simply no longer be printed in books and will remain exclusively as eBooks. Print runs sliding and high cost cutting will not be fun. In fact it will be unpleasant for pretty much everyone in the industry, but make no mistake, if the first part of the prediction is true, then the second part is inevitable. The structure of the industry MUST change if it is to adapt (that forgoes the obvious strategic issue of whether survival in a digital world IS possible for now. There’s some discussion of this over at Mike Shatzkin’s blog recently). The debate about ebooks and digital being the future IS over. What’s going on now is the shake out of how publishers change and adapt. I get the feeling that, for many people, this will be far more painful. Beautiful morning here in Dublin, almost makes me hold back in posting this! Hi Eoin, With eBooks being so much cheaper I was wondering is there any sign of a renaissance in pulp fiction or the electronic equivalent of dime store novels? Now that’s where my thinking is head to be honest! I suspect that the three major print markets will be cheap as chips paperbacks with low production standards, print in demand for mid market stuff and then hardbacks made with care and attention to detail. Fascinating. It’s a full time job keeping up with developments.